Is there anything on the planet as universally joyful as Gilbert and Sullivan? 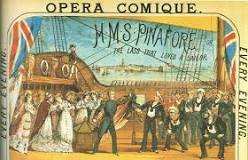 Whether or not you pay any attention to opera, you have heard Gilbert and Sullivan and have smiled. Whether or not you caught all the words, you knew something humorous was occurring. Just listen to the first two minutes and you will cheer up (even more if you’re already happy). Somehow these two plugged directly into our central wiring and created joy. We all love urban legends and one old chestnut goes something like this: the great explorer/traveler finds themselves on the doorstep of a native chieftain/drug cartel leader/small ocean island people after a hideous, arduous journey. Treated surprisingly well, the visitor is shocked to find their host(s) possess the complete Shakespeare, recordings of Gilbert and Sullivan operas, and a selection of religious texts. The visitor might be surprised, but we are not. After all, what else would you expect? Their collaboration lasted twenty five years or so, marked by periodic squabbling and ended in a refusal to even speak to one another. Fortunately, Gilbert and Sullivan seem to have patched things up just prior to Sullivan’s death. They were also business partners, tied together with Richard D’Oyly Carte, in management of their own theater. Loose collaborations (think of artistic movements like Impressionism) and more formal ones (think the Beatles) often appear to benefit from the ability of the group to be more powerful as a marketing entity than they would be as individuals. United Artists rose out of a recognition of this need to represent their own business interests as a unified front. is how this drives friendship and unity as well as creates new areas for friction. The more formal the arrangements then the more strident the break-up. Gilbert’s insistence on casting a favored protege was the straw that broke the camel’s back. Even worse, the formal relationship led to a truly harsh separation. Alternatively, the French Impressionists held their group shows and then slowly moved away or succumbed to various ailments. Letters kept being exchanged, but life moved along. Something happens when you must agree on the art and the business in detail. So, why the universality? A lot of the humor in the operas is political and you might think that would not translate terribly well to cultural experiences outside of 19th century Britain. Take When I was a Lad and you can see the problem. It’s a pretty wonderful send-up of British issues of the day. The truth is that Gilbert and Sullivan clearly latched onto that universal suspicion of those who lead us. In some weird way, you could almost think they were speaking truth to power. With Shakespeare, we focus on tragedy and comedy, but we often forget the power of his political commentary. We pass along these great works of art because they are more than entertainments, more than frolics and pastimes. Any art that teaches us to ask a few questions, sets a few brain cells firing, and allows us the joy of discovery will last as long as we can manage to carry a tune. You’ve Got to Check This Out is a blog series about music, words, and all sorts of artistic matters. It started with an explanation. 225 more to go.